Russia and the US have accused each other of failing to ease tensions in Ukraine after Kiev launched raids on pro-Moscow separatists. Russia said the US should make Kiev stop the attacks in the east, saying “nothing has been done to resolve this urgent crisis so far”. The US said Moscow had “actively stoked tensions in eastern Ukraine”. Russia ordered new military exercises on its border following the raids, drawing condemnation from Ukraine. The Russian foreign ministry issued a statement urging the US to “use all its influence with the interim government in Kiev to bring it to reason and convince it to refrain from rash steps that will plunge Ukraine even deeper into the depths of crisis”. It urged Washington to “understand the full measure of its responsibility for what is going on”. Both the US and Russia cited the April 17 Geneva agreement under which illegal armed groups, including those who have seized public buildings, must return home. But US state department spokeswoman Jennifer Psaki said Russia had “failed not only to provide public support for the de-escalation of tensions, but has actively stoked tensions in eastern Ukraine by engaging in inflammatory rhetoric”. Jennifer Psaki said Secretary of State John Kerry had spoken to Russian Foreign Minister Sergei Lavrov “six times since Geneva, and he has never once taken responsibility for the implementation of Russia’s Geneva commitments”. 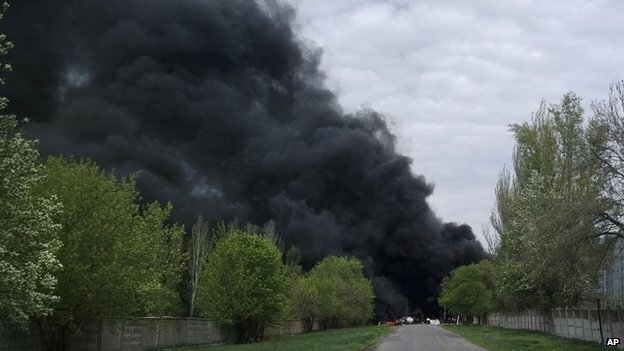 The morning raids by Ukrainian commandos on pro-Russian checkpoints around the town of Sloviansk had left at least two separatists dead. The raids were brief, with Sloviansk itself reported calm and pro-Russian militants still manning barricades in many areas. Russian Defense Minister Sergei Shoigu said Moscow had been “forced to react” to the raids by ordering new military exercises. Moscow has tens of thousands of troops along its side of the border. Russian television quoted the ambassador to the UN, Vitaly Churkin, as saying that Moscow would have “international-legal grounds” to deploy “peacekeepers” to Ukraine, as it had during the Russia-Georgia conflict of 2008. Ukraine’s acting President, Oleksandr Turchynov, called on Russia to pull back its troops from the border and end what he called its “blackmail”, adding that Kiev would not yield to “Russian-backed terrorists”. Foreign Minister Andriy Deshchytisa told the Associated Press that Ukrainian forces would fight the Russians if they had to. UN Secretary General Ban Ki-moon earlier said he was “seriously concerned that the situation could quickly spin out of control with consequences we cannot predict”.